3Department of Paediatrics, Royal College of Surgeons of Ireland, Dublin 2. Fetal Alcohol Spectrum Disorders (FASDs) are characterised by variable mental, physical, neurological and behavioural deficits, and are recognised internationally as a major contributor to intellectual impairment and disability, and one of the major causes of preventable developmental delay; true prevalence is unknown, but is estimated at 1-5% of all children in North American studies1,2. FASDs make a significant contribution to hidden disability as many affected patients have long delays before a diagnosis is made or are never diagnosed at all1. The umbrella of FASD includes Fetal Alcohol Syndrome (FAS), Partial Fetal Alcohol Syndrome (pFAS), Neurobehavioural Disorder associated with Prenatal Alcohol Exposure (ND-PAE) and Alcohol-related Birth Defects (ARBD). Fetal Alcohol Syndrome comprises only 10-15% of all cases, and over 75% of children with FASDs have no dysmorphic features to suggest an underlying aetiology to a clinician1,3. Diagnosing these conditions is challenging, and recent research suggests only half of American Academy of Paediatrics members are confident in their ability to make the diagnosis3. A key current concern is that children with FASDs other than Fetal Alcohol Syndrome may go undiagnosed due to the absence of dysmorphic features, a lack of accurate information regarding prenatal alcohol exposure, and the frequent incidence of comorbid neurodevelopmental or psychiatric conditions in children with FASDs; many cases of FASDs present with chronic mental health or neurodevelopmental problems1,2. No quantity of alcohol has been proven to be safe to consume during pregnancy; neither is any period of pregnancy immune to the effects of alcohol on the fetus1,2,4,5. Any alcohol consumption by expectant mothers at any point during pregnancy, including the third trimester, could be associated with adverse outcomes for the fetus, particularly given the frequency of binge drinking in Ireland6,7. Alcohol also increases the risk of miscarriage and premature delivery6,7. Adverse outcomes have been reported in Irish and international studies across low, moderate, and high levels of periconceptual alcohol exposure1,5,8,9. Historically, the lack of a precise dose-response relationship has led to inconsistent advice from healthcare providers and professional bodies with regards to the safety of alcohol in pregnancy1,3,7,8. Complete abstinence is now recommended in national guidelines for the USA, UK, Canada, New Zealand and Australia1,9. Recent Irish studies have found that 75-81% of expectant mothers in Ireland reported consuming alcohol in the periconceptual period7,8. One of these, a retrospective study covering 1987-2005, found that the majority of expectant mothers reduced their alcohol intake during pregnancy, and 27.6% abstained completely7. Nonetheless, it concluded that “the risk of alcohol related foetal (sic) harm in Ireland is high” and that systemic change would be required to support paediatricians and other doctors in the assessment and diagnosis of children exposed to alcohol in utero7. Doctors involved in the care of babies and children have a unique opportunity to identify children with problems related to alcohol exposure in utero. Research suggests that with early diagnosis and intervention, the impact of FASDs on a given child can be reduced; children with FASDs have a unique profile of needs and respond differently to treatments than children with other neurodevelopmental problems1,3,5,9,11-13. The lack of data regarding the prevalence of FASDs in Ireland in comparison to published prevalence rates in other countries, in the context of reported rates of alcohol consumption, suggests that these conditions may be underdiagnosed1,4,5,7,10. We circulated an online survey by email in June 2015 to all paediatric doctors in Ireland who were either enrolled in specialist training programmes (Senior House Officers or Specialist Registrars), or registered as trainers (Consultant Paediatricians). Total population 309; a sample of 172 was required for a margin of error of +/- 5% and 95% confidence interval. In anticipation of a response rate of 50-60% based on previous similar surveys, we emailed all eligible potential participants inviting them to complete the survey. Our survey consisted of multiple “agree/ disagree/ don’t know” questions regarding individual reported experience in diagnosing and managing Fetal Alcohol Spectrum Disorders, diagnostic criteria for Fetal Alcohol Syndrome and attitudes toward maternal alcohol consumption in pregnancy. Non-identifying demographic information was collected. Ethical approval was granted by the Research Ethics Committee of the Royal College of Physicians of Ireland. One hundred and seventy-nine responses were received (58% response rate): demographics are detailed in Table 1. 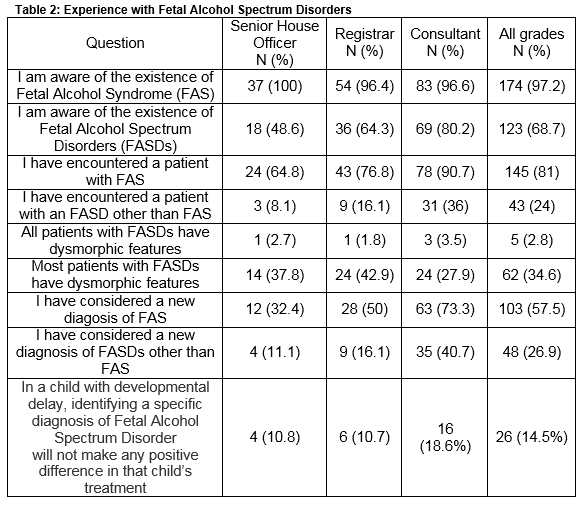 Results from questions relating to respondents’ experience with FASDs are detailed in Table 2. Consultants were found to have more experience and knowledge in this domain, but were also more likely to state that an FASD diagnosis would not make any difference to the management of a child with developmental delay (16, 18.6%). Fifty-six respondents (31.3%) across all grades were unaware of the existence of FASDs, including 19.8% of consultants. While 81% of respondents had encountered a patient with Fetal Alcohol Syndrome, only 24% had encountered a patient with other FASDs. A significant minority (34.6%) believed most patients with FASDs have dysmorphic features. Twenty-two respondents (12.3%) reported they had received formal education or instruction on FASDs other than Fetal Alcohol Syndrome, and 141 (78.8%) stated they would be interested in receiving training of this sort. 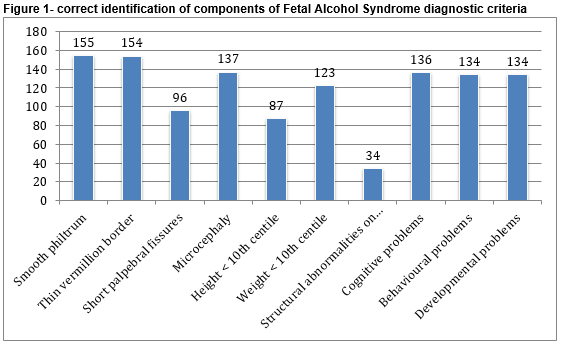 Respondents were presented with a list of physical features and findings, and asked to identify the ones included in the diagnostic criteria for Fetal Alcohol Syndrome. Figure 1 displays the number of correct responses for each of the component criteria. Correct answers were similar across all grades, with no more than a 5% difference noted between SHOs, Registrars and Consultants for any of the features. Senior House Officers were more likely to incorrectly include other features, most commonly micrognathia (n=16; 43.2%), cardiac malformations (n=15; 40.5%) and seizures (n=15; 40.5%). 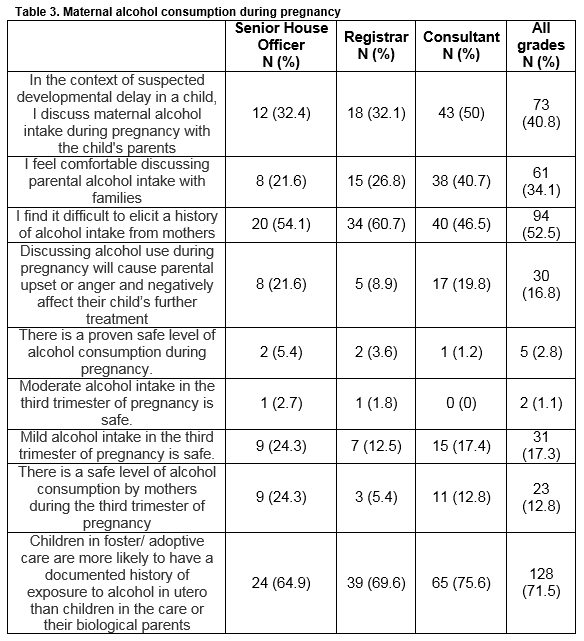 Table 3 details the responses to questions about maternal alcohol consumption in pregnancy. In the context of a child with developmental delay, 73 respondents (40.8%) routinely ask about maternal alcohol consumption during pregnancy (50% of consultants); 94 (52.5%) stated they find it difficult to elicit a history of alcohol intake. A significant minority stated that they felt uncomfortable discussing alcohol intake with parents (61, 34.1%), while 30 (16.8%) felt that discussing alcohol consumption could cause parental anger or upset and negatively affect the child’s treatment. Only 2.8% of respondents stated that a safe level of alcohol consumption in pregnancy had been proven, but 17.3% stated that mild alcohol intake in the third trimester of pregnancy is safe. One hundred and fifty-one respondents (84.4%) felt that a national awareness campaign with regards to FASDs and alcohol consumption during pregnancy would be useful. The majority of those surveyed reported that they do not routinely discuss maternal alcohol consumption in the context of developmental delay in children. Just over 17% believe mild alcohol intake in the third trimester is safe. Furthermore, almost one third were unaware of the existence of FASDs and over one third of respondents believed that most children with FASDs have dysmorphic features. These results suggest that paediatric doctors in Ireland may not routinely consider alcohol as a potential aetiological factor in the evaluation of children with developmental delay. Seventy-five percent of children with FASDs have no dysmorphic features or growth restriction1, and in the context of our results we hypothesize that in the absence of such features children with FASDs may go undiagnosed; this has been reported in other countries1,3,11. The lack of specific training reported by respondents in this area may be contributory. Only 24% of respondents reported having encountered a patient with FASDs other than Fetal Alcohol Syndrome. If international data indicating prevalence rates of over 1% of the total child population are to be believed 1,4,5,9, it is likely that most respondents have encountered children with undiagnosed FASDs. Just over 18% of consultants believed a diagnosis of FASD would not positively affect a child’s treatment. Research suggests that children with FASDs benefit from prompt diagnosis and early intervention with input from speech and language therapists, physiotherapy, occupational therapy and classroom support; it is possible to reduce the extent to which children are affected by the social, emotional, intellectual and behavioural problems associated with FASDs1,3,5,9,11,12. Children with FASDs may have co-existent autism or ADHD, but have different treatment needs and responses to children without FASDs11,12. Children with FASD and ADHD have poorer academic performance and a different profile of antisocial and behavioural problems than children with FASD alone11,12. Diagnosis before the age of six years has been shown to improve outcome13. Just over 17% respondents believe that “mild” alcohol intake in the third trimester is safe. We suggest that if alcohol is not considered harmful it is less likely to be considered in the diagnostic process. No level of alcohol consumption has ever been proven safe during pregnancy, and adverse child health outcomes and diagnoses of FASDs (including FAS) have been reported at even mild levels of reported alcohol consumption1,6,8,13,14. The prevalence of alcohol use during pregnancy in Ireland, despite a lack of evidence for any safe limit for alcohol consumption in pregnancy, is a significant public health concern and a target for intervention6-8,10. FASDs are 100% preventable if mothers abstain from alcohol consumption while pregnant, and previous research suggests health professionals do not always offer consistent advice in this regard1,5,9. Doubtless, there are other considerations. Alcohol may not be discussed routinely if another aetiology is readily apparent. Fetal Alcohol Spectrum Disorders are technically challenging to diagnose, and share some features with other disorders, including some which can exist as co-morbidities alongside FASDs (e.g. autism, ADHD). Opinions from a number of specialists may be sought before a diagnosis is reached, and genetic investigations may be indicated. This is before one considers understandable concerns about causing unnecessary guilt or anger in mothers which may arise from questions about alcohol consumption1,3. Furthermore, standardised assessment and treatment pathways are not currently in operation for children with FASDs in Ireland. It is worth acknowledging, as affirmed by the The International Charter for Prevention of Fetal Alcohol Spectrum Disorder5, that mothers should not be exposed to this kind of guilt or blame; alcohol consumption occurs within a larger cultural and social context and addressing these is more complex than simply improving awareness of FASDs amongst health professionals. However, professionals have an opportunity and a responsibility to offer expectant mothers accurate advice about the risks of alcohol consumption during pregnancy and to remain vigilant for its consequences. Our study has a number of limitations. It is a survey of self-reported knowledge and practice, rather than an observational study of practice habits and diagnosis. Twenty-two consultants were working in specialties in which contact with or diagnosis of FASDs would not be a common occurrence. Furthermore, it is a study of paediatric doctors only; it would be interesting to ascertain the practices of doctors working in other specialties, as well as those of midwives, nurses and other health professionals. Paediatric doctors are not chiefly involved in antenatal counselling, and so our attitudes to alcohol consumption during pregnancy have a limited impact in this area. We only surveyed doctors involved in training or registered as trainers with RCPI; this was for survey distribution reasons. The performance of individuals in this survey cannot be extrapolated to imply the performance of medical teams or of the health system as a whole; senior doctors performed better in many areas of this survey, and may act as a safety net for their more junior colleagues. We do not infer that the results of this survey are the only factors contributing to the lack of recognition given to FASDs in Ireland. International data regarding the prevalence of FASDs and Irish data regarding alcohol consumption suggest that Fetal Alcohol Spectrum Disorders are a significant hidden public health issue in Ireland1,4-8,10-13. This will only begin to be addressed when the disease burden is measured; defining the current practices of doctors in the evaluation of developmental delay in the context of alcohol consumption is a key step. Our results suggest conversations about alcohol are often not included in the routine evaluation of developmental delay in children in Ireland. The fact that a majority of those surveyed indicated that further training would be welcomed is a source for optimism but a more far-reaching multiagency approach will be required to begin to address the burden of FASDs. The authors would like to thank all of our colleagues who took the time to respond to this survey. 7. Barry S, Kearney A, Daly S, Lawlor E, McNamee E, Barry J. The Coombe Women’s Hospital study of alcohol, smoking and illicit drug use 1987 – 2005; Dublin; 2007. 8. Mullally A, Cleary B, Barry J, Fahey TP, Murphy DJ. Prevalence, predictors and perinatal outcomes of peri-conceptional alcohol exposure - retrospective cohort study in an urban obstetric population in Ireland. BMC Pregnancy Childbirth. 2011; 11: 27.